Today would have been my dad's 57th birthday. I think he's probably having a good time where he's at right now, but we still miss him here. It's been a year and a half since he died but in many ways it feels like just yesterday. Still, so much life has been lived during these past many months and it's hard to imagine that he isn't aware of all our life changes and new family additions. Little things remind me of him and I notice things about myself that he either liked or found amusing. One of the things I inherited from my dad was an interest in World War II history. This love for it grew upon me so gradually that I'm not even sure when I acknowledged my interest in this era, but this was a subject matter that my dad would read a lot of books about and enjoyed thinking and talking about. 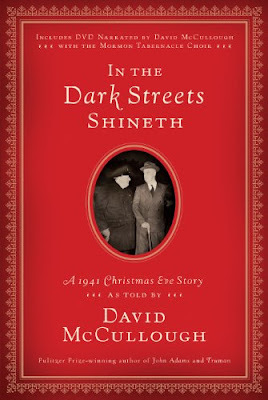 Included with the book is a DVD which has McCullough's narration with the Mormon Tabernacle Choir. I think this DVD is a wonderful addition to the book and I'm glad I was able to view this for myself. Very powerful and moving presentation, to be sure! I love this little book for all that it is, and for all that it isn't. It is a "simple" presentation of what Christmas was like in December 1941 when our nation was at war. It is a reminder of all that we have to be grateful for this Christmas season. To our troops who are serving abroad, (and their families who are missing them! ), I offer my thanks to you. To both of my parents who taught me to love and appreciate history and see it as being applicable and meaningful for today, I thank you also. To the Lord who does all things well and Whose plans are much better than my own, I am (learning to be) grateful. I know that God is good all of the time. I can't share this book with my dad this Christmas, but I can remember him and I'm doing that today. You share so much of yourself through your book reviews. Thank you! Hugs to you as you miss your dad this Christmas. Bless you as you Celebrate this Chirstmas..I too lost a parent when she was in her 50's. In fact she went to the Hosp. Christmas Eve and died Jan 4th...we will always remember out loved ones...even many years later. So sorry for your loss, but glad you have such fond memories and things to connect on. What beautiful memories! Thank you for sharing through a beautifully, written, review! Sounds like a wonderful book. I'm sure your dad is very proud of the Christian woman you have become and are continuing to mature into!! My heart goes out to you in remembrance of your dad. Birthdays, holidays, the anniversaries of their deaths are all mixed emotion days -- missing them, but glad for the opportunity to remember and reflect.